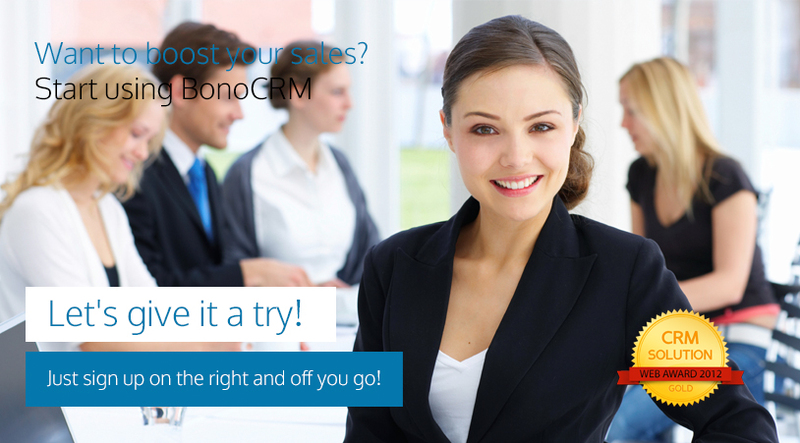 Simplify your work with BonoCRM and increase your sales. BonoCRM is designed to replace the way how you manage and work with your present and prospecting (future) clients. With BonoCRM you can do it more effectively. Remember everything about your clients and prospects. Always know when, why and which client you need to get in touch with and supposedly - close the sale. With BonoCRM it is super easy to maintain and grow your client base. Do your work in always organized fashion. Know what tasks you need to do today, tomorrow, this week, next week or in the far future - and, of course, if any - the ones you are already late to complete. 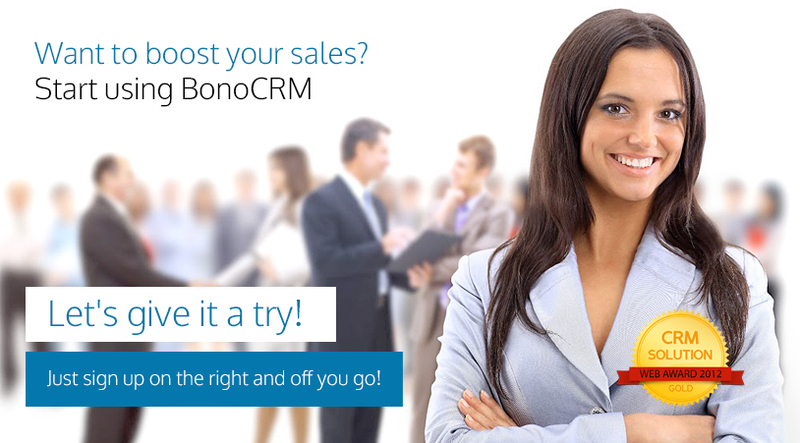 Use BonoCRM to become the superstar salesman in your organization. Proactive and timely communication with prospecting clients is the key to the successful sales process. Keep life simple, start using BonoCRM - and everything you must to remember will appear when needed in clean, simple and nice BonoCRM screen. No more mess with sticky yellow notes all over the place. Have you ever lost a deal because of a lost / forgotten sticky note? Throw them all away – start using BonoCRM as an every modern salesman should do – to become a supersalesman. .
Access your information anytime and anywhere, without the need to download or install anything. That's why it is called web based software. Just open your web browser. Hey, since you now have discovered BonoCRM, you no longer need any of those expensive, slow and not intuitive software applications running on your desktop, nor do You need to maintain an IT personnel to support it anymore. Forget all of your IT related problems you have had in the past. Just start using BonocRM which works straight from Your browser. Bring your focus back to customers and let us manage the IT side of the business. In spanish BONO means - bond, relation, connection. In latin BONO means - good. Well, besides of our main responsibility of building custom web solutions for our clients, we ourselves have learned that the information flow we encounter everyday about our clients, tasks and responsibilities is too big to cope with with the traditional tools. We have tried various CRM solutions one after another but found most of them too complex, with too many unnecessary windows, buttons and not intuitive interfaces. So we, here at ES4B, decided that we need to build a customer relationship management solution ourselves. And because it has to be good, we had to call it – a BonoCRM. We invite you all to try BonoCRM and start using it everyday, as we do ourselves. We hope you will join us in this journey of building a perfect CRM. We just have started developing BonoCRM, so if You want be part of the process, you are more than welcome to tell us your opinion and suggestions. If you have an idea on mind that you think could improve BonoCRM and make it more convenient and suitable for you – drop us an email. "To support our growth we needed to move quickly to take advantage of the efficiencies this capability represents. We have started using BonoCRM and this decision definitely was a big move forward to our sales team." "BonoCRM has helped us to keep our customer service levels up to the very high standards." 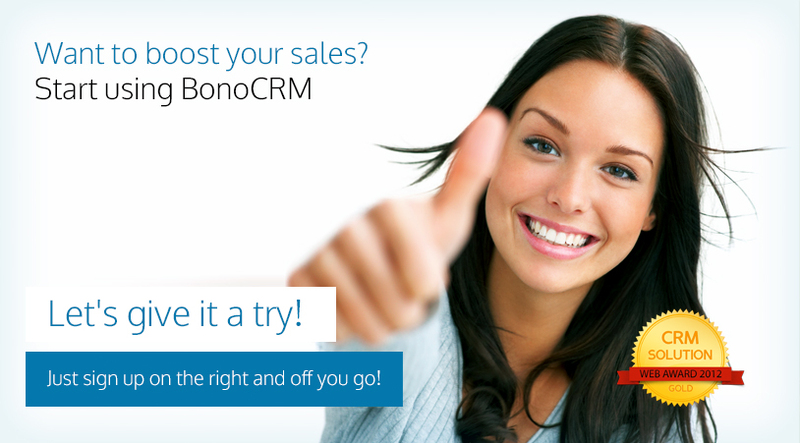 "After we have started using BonoCRM, our sales increased 35% and profits 62%." "Because BonoCRM is free and web browser based - it completely eliminated our costs of acquiring, constantly updating and maintaining our own in-house CRM system."